(Nanowerk News) Researchers at Purdue University have discovered a new approach for repairing damaged nerve fibers in spinal cord injuries using nano-spheres that could be injected into the blood shortly after an accident. Researchers have been studying how to deliver drugs for cancer treatment and other therapies using these spheres. Medications might be harbored in the cores and ferried to diseased or damaged tissue. Purdue researchers have now shown that the micelles themselves repair damaged axons, fibers that transmit electrical impulses in the spinal cord. "That was a very surprising discovery," said Ji-Xin Cheng, an associate professor in the Weldon School of Biomedical Engineering and Department of Chemistry. "Micelles have been used for 30 years as drug-delivery vehicles in research, but no one has ever used them directly as a medicine." Findings are detailed in a research paper appearing Sunday (Nov. 8) in the journal Nature Nanotechnology ("Effective Repair of Traumatically Injured Spinal Cord by Nanoscale Block Copolymer Micelles"). A critical feature of micelles is that they combine two types of polymers, one being hydrophobic and the other hydrophilic, meaning they are either unable or able to mix with water. The hydrophobic core can be loaded with drugs to treat disease. The micelles might be used instead of more conventional "membrane sealing agents," including polyethylene glycol, which makes up the outer shell of the micelles. Because of the nanoscale size and the polyethylene glycol shell of the micelles, they are not quickly filtered by the kidney or captured by the liver, enabling them to remain in the bloodstream long enough to circulate to damaged tissues. 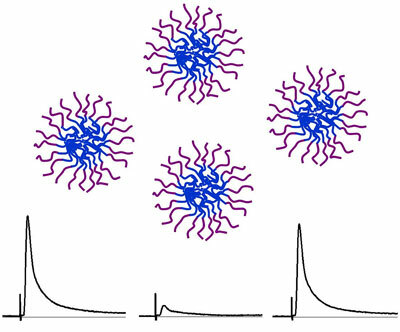 In research led by biomedical engineering doctoral student Yunzhou Shi, the micelles also were shown to be non-toxic at the concentrations required. "With the micelles, you need only about 1/100,000th the concentration of regular polyethylene glycol," Cheng said. Ongoing research at Purdue has shown the benefits of polyethylene glycol, or PEG, to treat animals with spinal cord injuries. The work is led by Richard Borgens, director of the Center for Paralysis Research and the Mari Hulman George Professor of Neurology in the School of Veterinary Medicine. Findings have shown that PEG specifically targets damaged cells and seals the injured area, reducing further damage. It also helps restore cell function. The new findings were made possible by the interdisciplinary nature of the work, which involves Borgens and other Purdue researchers, Cheng said. The collaboration included Borgens; Riyi Shi, an associate professor of biomedical engineering and basic medical sciences; and Kinam Park, Showalter Distinguished Professor of Biomedical Engineering and a professor of pharmaceutics. Findings showed that cores made of particular materials work better than others at restoring function to damaged axons, which are slender extensions of nerve cells. The research also showed that without the micelles treatment about 18 percent of axons recover in a segment of damaged spinal cord tested in a "double sucrose gap recording chamber." The micelles treatment boosted the axon recovery to about 60 percent. The researchers used the chamber to study how well micelles repaired damaged nerve cells by measuring the "compound action potential," or the ability of a spinal cord to transmit signals. The experiment mimics what happens during a traumatic spinal cord injury. Findings showed that micelles might be used to repair axon membranes damaged by compression injuries, a common type of spine injury. The researchers also tracked dyed micelles in rats, demonstrating that the nanoparticles were successfully delivered to injury sites. Findings also showed micelles-treated animals recovered the coordinated control of all four limbs, whereas animals treated with conventional polyethylene glycol did not.